Inspiration in Life: My father - He’s 58 and still runs 15 miles a day. He was a fighter pilot for 20 years and is the most genuinely kind and caring person I know. He did an absolutely amazing job raising his kids and I couldn’t image life without him. What is your favorite sport? Surfing and hockey. 3 Words to Describe You: Outgoing, resilient/savvy and candid. If You Could Have 3 Things on The Island What Would They Be and Why? 1. A hammock because I seriously love those things and people lying in them tend to be happier. 2. A camera because I would like to be able to look back on this experience and show my loved ones Survivor from my perspective, not the TV one they’ll see. 3. Sour candy because I love sour candy. SURVIVOR Contestant You Are Most Like: Malcolm. He’s just like me in guy form, or maybe Kate, as she had a strong personality. 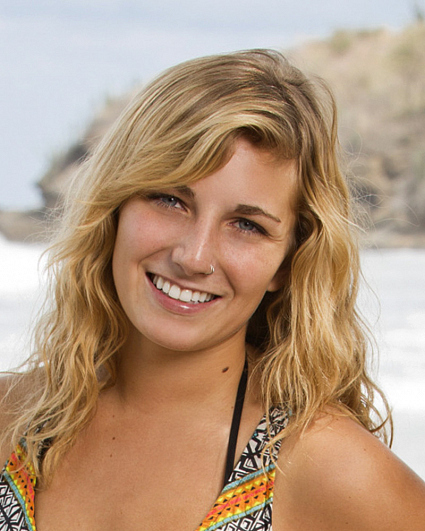 Reason for Being on SURVIVOR: I’ve wanted to be on the show since I watched the first season in third grade. I would absolutely kill it in the game and I could use the bucks. Why You’ll “Survive” SURVIVOR: I believe I would boost morale, as well as provide food for the camp because I like to think of myself as a decent cook and fisherman. I also am very confident and would absolutely kill it in physical and mental challenges. Why Will You Be the Sole SURVIVOR: I’ve seen every season. I know how to win and I know what strategies work and for how long/when in the game they are best to start using. Also, I’m mean enough to make it to the end but likeable enough to still get the jury’s votes. Plus, I can BS my way through just about any situation.